Ben Hoffler grew up in the Midlands, UK. He studied geography at Hertford College, Oxford, before working as a shipwreck hunter for Odyssey Marine Exploration. 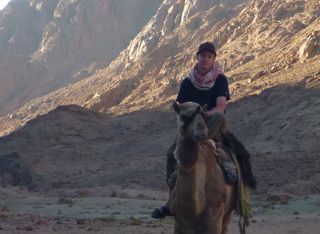 In 2008, he moved to Egypt and soon discovered the Sinai, walking the peninsula as widely as possible. He lives in Alexandria now and spends a few months in the Sinai every year. He's a Fellow of the Royal Geographical Society and has a special interest in the nomadic cultures of the Middle East.